How does a mattress company, entrenched in brick and mortar distribution, enter the noisy direct-to-consumer category with a unique point of view? Originally designed as a refreshing departure from the sales tactics and markups of retail, the direct-to-consumer (DTC) mattress industry is now a sea of sameness. With rare exception, all DTC players use the same visual and verbal language, promise better sleep and comfort, and deploy an array of superlative, proprietary™ and ironically similar product claims. Symbol Mattress, the oldest, privately owned mattress company in America, established LUFT in 2017 with a desire to pull away from this sea of sameness but had somehow found itself lost in a morass of competitive claims and cutthroat competition. They asked us to create an identity for LUFT that resonated with customers, distinguished it from competitors, and remained true to the company’s manufacturing origins and beliefs. Everyone needs a mattress, but shopping online is no longer a refuge from the shady business practices of brick and mortar. What began as a simple promise of “one size fits all” with clear pay scales, free shipping and effortless returns has morphed into a myriad of product claims about components. Unable to find a clear answer from brands, shoppers turn to customer reviews only to discover many are based on quid pro quo. Joy, not jargon. Our target sees a great mattress and good night sleep as means to a more profound, positive and lasting emotional state the next day. By contrast, the category almost universally focuses on the means and not the end goal. Craft, not components. Yes, customers need details about what is inside their mattress. But components are cold and rational. Our target wants to buy from a brand that understands how they sleep and then tailors their products to meet those needs. Manufacturers, not marketers. Most DTCs are simply marketing plans backed by venture capital that outsource manufacturing to third parties (sometimes even Symbol). Our target can see through this and would prefer buying from a brand that both “walks the talk” and is hands on in the craftsmanship of their products. In a world of one size fits all, LUFT is your size fits you. We needed a brand identity that would live up to the promise of bringing joy back to the DTC mattress category. With competitive audit in hand, and with solid direction from our clients, we elevated every aspect of the brands voice, visual language and vibe. We buy into bliss and dig on delight. We’re stimulated by thoughtful design. We’re satisfied by comfortable surroundings. looking for a little more lift in our lives. We overhauled the entire site, but the most important and fundamental shift was flipping the shopping experience on it’s head. 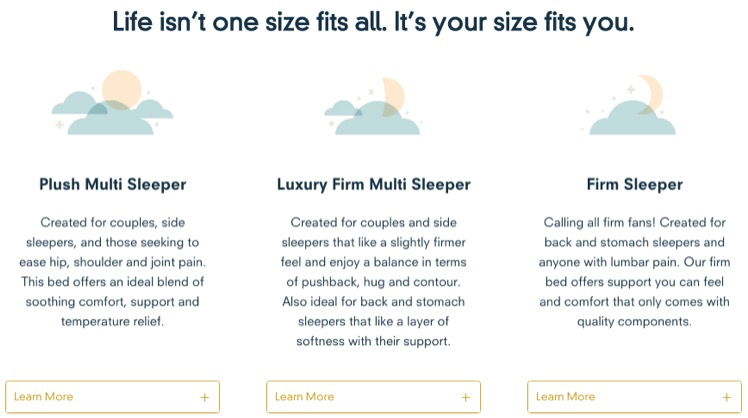 While other DTCs assume your shopping experience starts with size, price and components, we recognizing our customers wanted to find a mattress based on how they sleep. To assist them, we designed a simple interface to help them discover the mattress that is right for them. Brand and UX innovation warranted a new look at our product. Breaking away from the sea of sameness, our brief to LUFT product designers lead to innovations in form. Subtleties like inverted seams and a bold, geometric pattern helps LUFT mattresses stand out from the pack. We then wrapped our brand standards around every physical touchpoint to ensure an unwrapping experience aligned with our brand promise.